What is The Ride For Roswell? 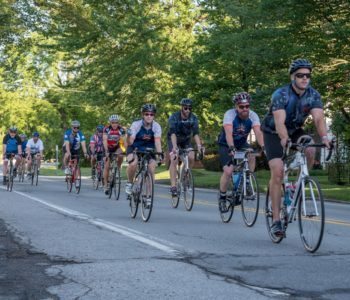 The Ride For Roswell is one of the nation's largest cycling events - a life-changing experience for riders, volunteers and cancer patients who benefit from the funds raised. It's a charity bike ride that brings people together to celebrate survivors, pay tribute to those we've lost and share in the passion that connects us all: finding a cure for cancer. The purpose, the passion and the commitment to end cancer once and for all fuels The Ride For Roswell. On a Ride Team? Check out these contests! Recruitment & Fundraising contests, plus a look at Team Rewards! Teams who recruit 10 or more members by April 30, 2019 will be entered to win a catered team tent on Ride Day, with a special delivery from Sabretooth! Once your team is all registered, get to fundraising. Teams who raise $10,000 by May 31, 2019 will receive a Ride For Roswell branded rolling cooler! We have a route for you! From a family 3-mile river route to a 100-mile century ride through the country, The Ride For Roswell has a route for everyone who wants to impact the fight against cancer. Click below to find your route and all your route information, including its start time, to get ready for an unforgettable event! Asking your friends and family for donations can be a challenging task, but asking everyone you know helps you become a great fundraiser! From now until The Ride, we’ll be featuring the top weekly go-getters who have secured the greatest number of donors for that specific week. So ask everyone you know to donate and don't be afraid to remind them. Need help fundraising? Check out our Fundraising Tools Page! "We proudly support The Ride For Roswell!"